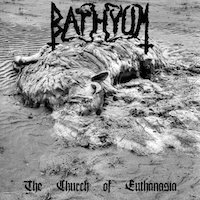 When you hear the start of “Ceremony of the Pagan Queen”, you’ll instantly think about the influences from the 2nd Generation of Black Metal. The tempo is fast and phenomenal. The vocals hit hard and deep, they are raw and pulsating. For a one-man band, the skills are heard from vocals and all instruments throughout. The Black, raw passion oozes from the song. The beat slows towards the end to enable us to catch our breath. The tempo picks up once more, not allowing much respite. The song is everything you want and need from Black Metal. “Summoning the Army of Spectral Stars” is a deeper, more doom starting song. The dark vocals create a Black feel around the song. The beat is heavy and the ambience thick. For a song under 5 minutes it certainly makes a quick impression. The guitar feels more like it’s mixing the darkness together before unleashing it. The tempo is so well balanced here, the feel is once again containing the best parts of Black Metal. “Witches of Bidston Hill” does not keep the pace from the previous song. It goes up the gears instantly. The vocals once more are dark, not trying to replicate anyone else. Using his own skills in the most destructive ways. The instruments are so skillfully played that the melody is one you’d except to hear from the likes of DISSECTION. Which, from this writer, is a huge compliment. The song contains a few very well-used deathgrowls, adding further depth to an already brilliant piece of work. “I Never Asked to Be Born” once more contains more Melodic feels like before, by now this is a sound that you’ve come to love. The sound is immense again. An Atmospheric masterclass is what hits your ears. It’s a modern-day masterpiece, played with styles of the good years. The song slows down completely mid-way, showing a new side that we have not seen. Again, this is similar to certain DISSECTION songs, but those songs never broke away like this does. It slow stance is broken just as you mellow out. It’s a fantastic switch and the songs kicks into life once more.